Florida Survival Gardening: My Publisher Introduces "Compost Everything"
My Publisher Introduces "Compost Everything"
"You didn't see this one coming. WE certainly didn't see it coming. Apparently Castalia House isn't merely disrupting the entire book distribution system, we're throwing out pretty much all the rules for how a reasonable publishing house is supposed to operate. 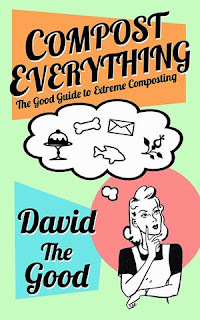 Which is the only rational way to explain our latest book, COMPOST EVERYTHING: The Good Guide to Extreme Composting by David the Good. You know I will not lie to you. I do not know a single damn thing about gardening, composting, or pretty much any activity that involves getting my hands dirty with anything other than human blood or gunpowder. Nor do I have any interest in growing fruit, vegetables, or anything beyond green grass in the yard. That being said, COMPOST EVERYTHING is actually a surprisingly entertaining read, mostly due to the fact that the author, David the Good, is quite clearly insane. I mean, this man not only knows more about gardening than I do about games, he experiments with his garden in ways that would cause any reasonable wife to not only leave, but file a restraining order and move to the barren land of Mordor where nothing green ever grows."